This site is dedicated to the Veterans of a vicious war which is largely ignored. The focus is on the last years of the Mandate but also included are memories of Egypt and some war service, as well as experiences of non-British participants and a little background to give context. 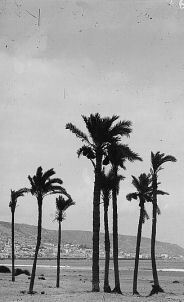 During the war Palestine had been a place to go on leave from the Western Desert, get medical treatment or where supply, repair and training units were based. Those fighting Vichy forces in Syria or Iraq also passed through, and it was used for supplies going north to the Russians. It was relatively peaceful as there was something of a truce with the Palestinian Arabs and the Zionist Jews (apart from the Stern and Irgun gangsters) while the common enemy was fought. When the war ended British and Empire forces were spread around the globe: Europe, the Middle East, India, Africa and the Far East; all wanted to go home. Disbanding so many was difficult and experienced men had to be slowly replaced by conscripts so there was a mix of battle-hardened men and raw recruits although many young people from cities had plenty of experience of danger as many had acted as runners through the blitz or performed other responsible tasks. 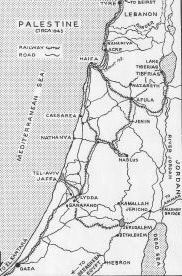 However, the young men and women posted to Palestine in 1945 either as regulars or conscripts had little idea that while fighting was supposed to be over this was far from the case in Palestine. Some units had been preparing for embarkation to the USA for training to invade Japan as part of Operation Olympic and a battalion of the Argylls, for instance, had been preparing to move to India. 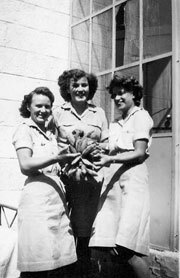 Suddenly, with the dropping of the atom bombs on Japan the war was over and while looking forward to going home many found themselves instead in Palestine. As the violence there escalated troops realized that the politicians had put them into an impossible situation and everyone was still very much on Active Service. Some like Bill Greenfield had joined up for the 'State of the Emergency' in 1939 and expected to serve for six months. He chose the army and terra firma ("the more firma, the less terror"). It was seven and a half years before he was demobbed and his daughter was four when he finally saw her. This was not unusual. Some units had taken part in the Normandy landings and helped liberate concentration camps so had great sympathy for Jews. Unfortunately, because of the hated immigration controls and effective Zionist propaganda, they soon learnt to get used to, and not retaliate, when abused, spat upon and called Nazis by Jews in Palestine. (Ironically, in the thirties incoming German Jews had also been abused as Nazis.) Even in ordinary day-to-day dealings it was not unusual for someone to spit at, for instance, a Palestine Police Officer simply after receiving directions. This was normal daily discourtesy but the increasing level of violence meant that service personnel had to be prepared to be attacked, ambushed or bombed at any time by anybody. During the last 18 months of the Mandate troops were attacked every day and even after the date of withdrawal was announced in November 1947, and murder gained nothing, more than 200 British service personnel were killed. Albert Kemp from Aberdeen missed a Palestine posting because he slept in and got 7 days instead. You could always try slipping the Posting Sergeant a packet of Players but this wasn't a particularly reliable method of avoiding Palestine. On the other hand, Palestine did have sunshine and plenty of food whereas at home there were problems with jobs, housing, grim winters, and rationing (even bread) which had been in place since January 1940 and would continue into the early 50s. Palestine had goodies not seen for years  a sandbag full of oranges was only a shilling and at home your ration was one egg a week, in Palestine: as many as you liked. 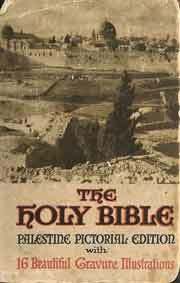 For many, brought up on stories about the Holy Land, going to Palestine was a privilege and they were eager to see places mentioned in the Bible though it was not quite the 'Holy Land' they expected. It was in Nazareth, for instance, that Guardsman Eric Farthing was shot at for the first time. In spite of the violence many servicemen did go sightseeing in Nazareth, Bethlehem and Jerusalem and saw their Sunday School pictures come alive. As the violence between Palestinian Arabs and Zionists increased, however, troops were confined to barracks except when on duty. Experiences of officers and men, of course, were very different. 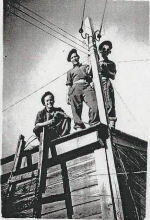 The officers, although facing the same violence, at least had generally better food and accommodation and enjoyed lunches, dances and cocktails in messes and hotels. 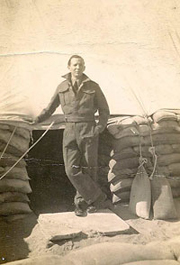 In 1947 Captain Philip Brutton was still enjoying hunts with the Ramle Vale. The men managed with cinema, the NAAFI, occasional visiting shows, and football on a dusty piece of ground. If they were lucky they had access to a swimming pool or beach. 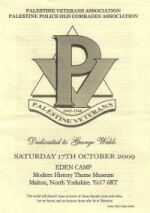 The Palestine Veterans Association will be holding their last reunion on Saturday, 20th October 2018 at Eden Camp, Malton, North Yorkshire, where there is also an exhibition about Palestine in Hut 13. 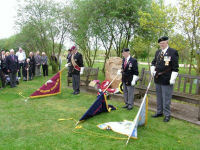 Each May there is a Memorial Service at the National Memorial Arboretum, Alrewas, in Staffordshire. PPOCA (Palestine Police Old Comrades Association) also hold a memorial service here in June. 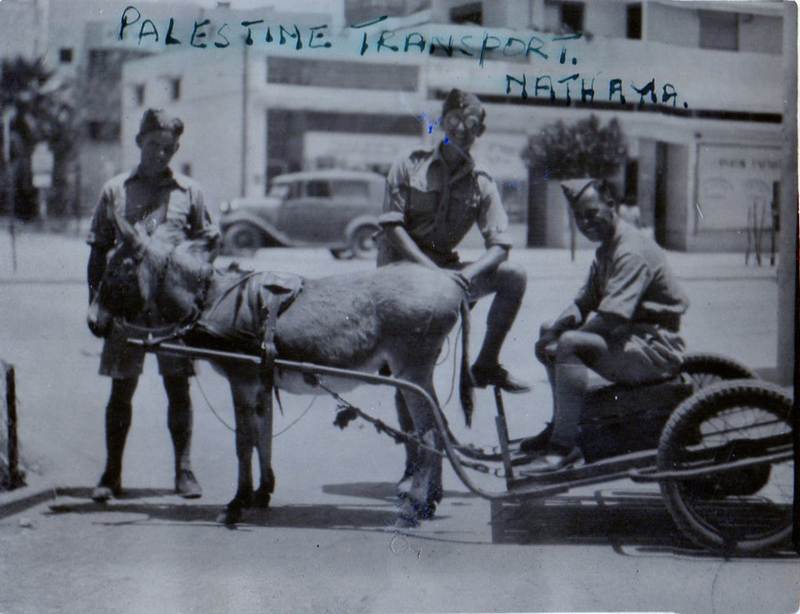 For WWII Veterans wishing to revisit Palestine Heroes Return funding may help with costs. Searching: correct spelling is essential; try variations if unsuccessful. You can then use Find in your browser. Spelling of place names is tricky and variable so I have tried to keep to the spelling of the time. Greyed out links are being developed; those to other sites open in a new window so please let me know if any have disappeared. There are transcripts for all the audio files. This site is updated frequently; pages added or changed and photos and audio clips added. Content is mostly first-hand accounts, photos and ephemera from veterans, but books, private manuscripts and official archives have also been used. If you or anyone you know were in Palestine at the time and can contribute to these pages with text or photos please contact Webmaster. I would also like to know of any inaccuracies. "There is a danger of historically proven facts, clearly established, with the passage of time being deleted from the records for political reasons, a kind of moral weakness." 'Forgotten Conscripts', Eric Lowe.